What’s new in our house? 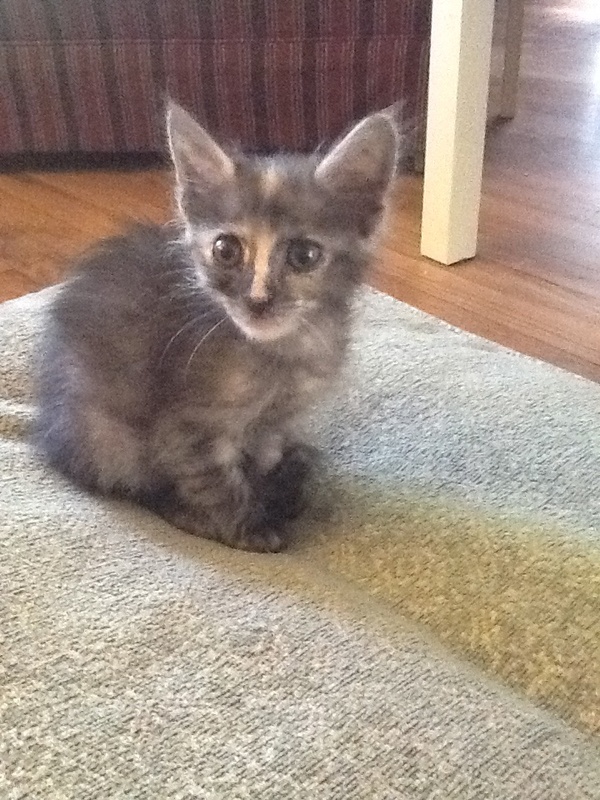 Well, as I mentioned in my earlier posts … we decided to foster a couple of kittens who will soon be up for adoption through a rescue group called Dori’s Darlings. I met up with Dori yesterday after work and picked up my two cutie pies! We all had fun watching them explore last night. I haven’t been this tired since I had a newborn waking me up every few hours. Well, maybe not that bad. I did fall asleep in the McDonald drive-thru lane while waiting for my caffeinated Coke. So, I am pretty tired. Dori called her a tortoise muted calico, or something like that. Oliver says … ‘the one with the spot on her head’. 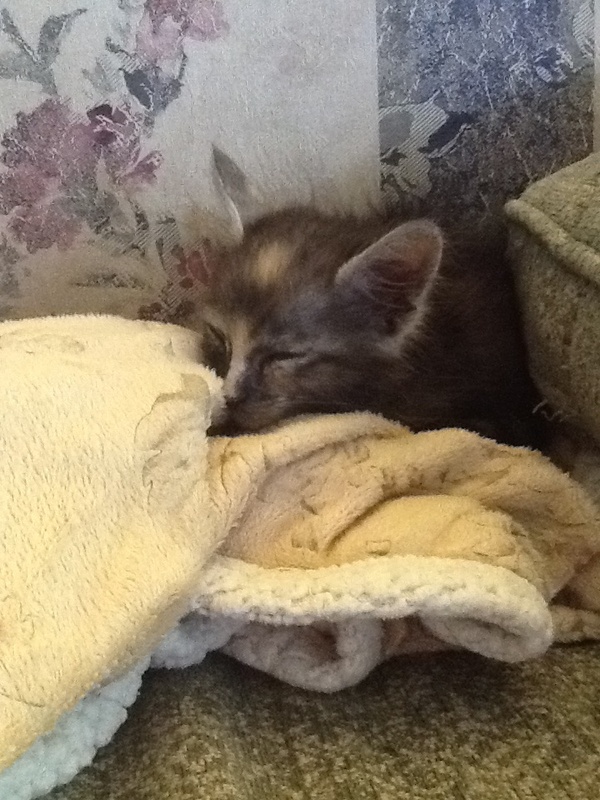 The kittens are about 8-9 weeks old, but they are very much underweight. So our goal is to fatten them up so they can get their final immunizations and get spayed. Once that is done, they can go up for adoption. Cute – right? Dori also mentioned something like … “It’s ok if you become a failed foster ….”. I was thinking – hey – I just got them – give me a chance!! But she meant, fosters who decide to adopt them for their own families… so, I get it. And yes, that is a very big risk for us. The kids didn’t touch the iPads all night!! Bonus! I would show you the other one, called Bobbie (because she has a bobbed tail). Her name is temporarily “Sparkle”. However, I couldn’t locate her as we were heading out the door – and unlike a baby newborn, I just left out enough food and yelled out ‘Bye Kitties!’ and didn’t worry too much about it. She’s the one who slept under the couch last night. Quilting… well, …. the good news is that my friend doesn’t even know I’m making the quilt for her – so she isn’t expecting it at any particular time. I have to connect my last row of blocks to the first two rows and then I can add the border. Almost there… almost there. I will post a picture of my quilt top when it’s done before I send it off, and then an update when it gets back and certainly one with Beatriz (the newlywed). Hope all is well with you today! Thanks for stopping by! what an adorable kitten! I’ll be looking for a pic of the other little feline. So wonderful of you to offer these kitties a stable home to get them ready for a new family. I wouldn’t blame you if you failed the foster parent test and wound up keeping them. I know I would be sorely tempted!! Will they keep you company when you are quilting? Awwwww what a sweet little baby! (My Katy is asleep on top of my cutting table as I write this.) I know your two little charges will love all the attention. Glad your kids are enjoying them!